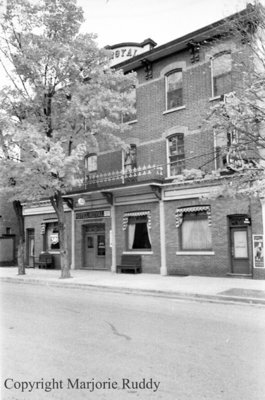 A black and white negative of the Royal Hotel in Whitby, Ontario. Royal Hotel was located at 171 Brock Street North. Antoine (Tony) Rousseau was proprietor of the Royal Hotel at the time of this photograph. The Royal Hotel was built on the east side of Brock Street North in 1872-3. Royal Hotel, October 1939, Marjorie Ruddy. Whitby Archives A2013_040_1011A.